Alessia Scarso's Italo is in the lineup of Portland, Oregon's 2017 Italian Film Festival, which runs April 7 - 19. Click here for details. 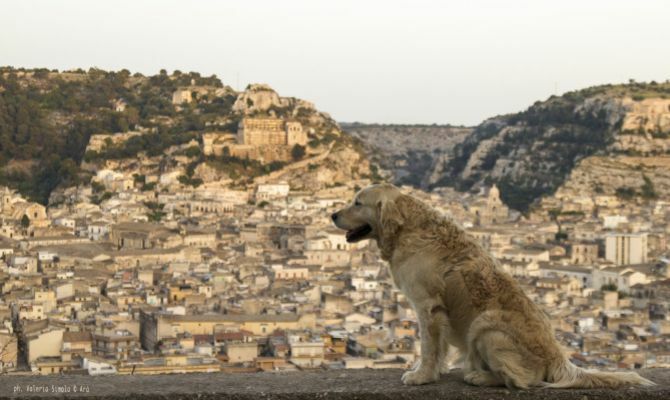 Based on actual events, Italo is the touching story of a stray dog adored by a small village in Sicily. Known all over Italy, Italo first appeared in the town of Scicli, located in the province of Ragusa, in 2008. Nobody knows for sure where the dog came from but he most likely belonged to a homeless man that passed away. Upon his arrival in Scicli, Italo’s presence was felt by all of the city. He frequented town meetings, masses, weddings and funerals. He was greeted tourists. He posed for selfies and protected his beloved citizens. In 2011, Italo was hit by a car. He was able to recover from the incident but the trauma combined with other age-related health issues took its toll and he died shortly thereafter. He is buried in the town and his grave has become a famous site, always adorned with flowers and notes. 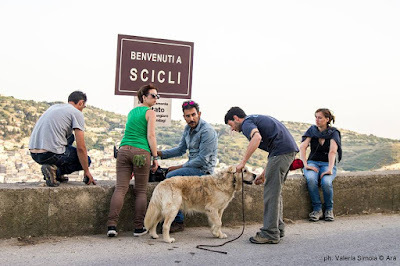 Thanks to Scarso, Italo’s story has crossed Italian borders and after several screenings across North America, we, too, have fallen in love with this gentle, loving soul. While watching this film, I couldn’t help but think of Hachi: A Dog's Tale starring Richard Gere. Like that film, Italo is a tearjerker. Perhaps due to the fact that I knew the ending going into this film, I was crying all through it. I was also so moved by the performances by the young actors and their sweet interaction with the dog, I couldn’t hold back the tears. I can imagine there were several angles from which this story could have been told. Scarso chose to show the viewpoint of a child (Vincenzo Lauretta) who recently lost his mother, and his newly-widowed father (Marco Bocci) dealing with the challenges of being a single parent. Italo takes a liking to the boy and the two form a strong bond. Unlike Hachi’s heavy dramatic story, Italo’s is a light comedy with dramatic undertones. Perhaps because Italo brought so much happiness to the town, a drama wouldn’t have suited his memory. Scarso uses a whimsical soundtrack to accent the joy in every step that Italo brought to the people of Scicli, and in doing so, creates a charming, poignant homage. 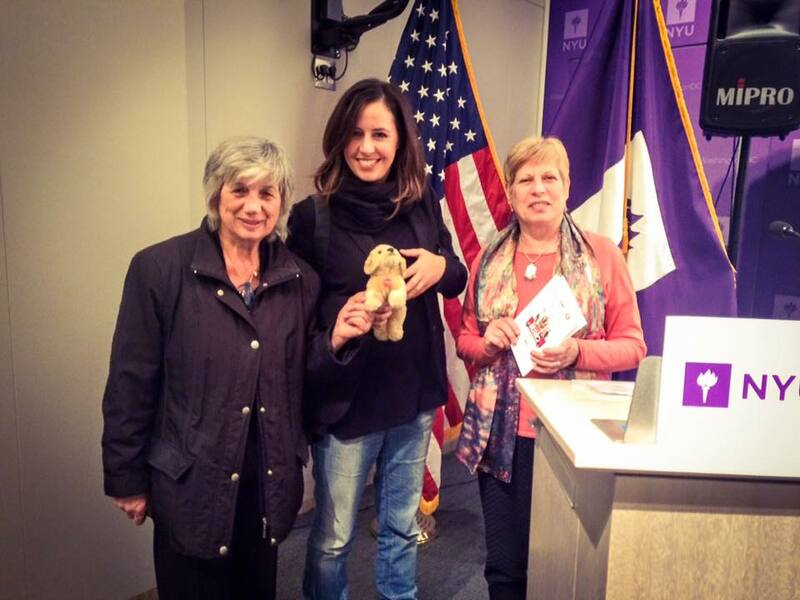 Alessia Scarso (center) at the Italian Institute of Culture in Washington D.C.
Alessia Scarso has a fascinating story herself. 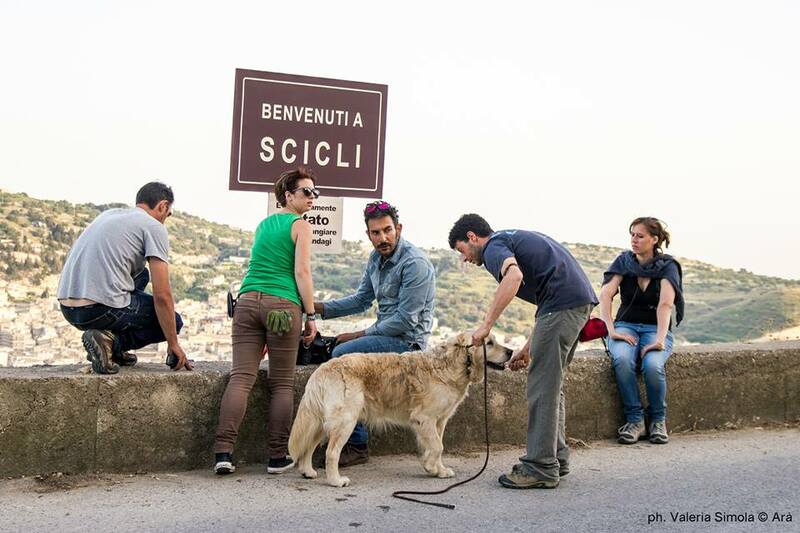 She was born in Modica, Sicily and studied film editing at Rome’s Centro Sperimentale di Cinematografia. She has worked as an editor and post-production coordinator for investigative journalism stories, films and documentaries. She’s also directed several commercials. She shifted her focus to film directing with her debut short Uninstalling Love. It was shown at film festivals and won a whole slew of awards. Italo is her first feature-length film, and I’d say it’s a pretty impressive debut as the main characters are children and a dog. Italo first came under my radar in 2014 when it premiered at the Taormina Film Festival. I was thrilled when I saw it begin to tour the United States, so I contacted Scarso through social media to ask her about Italo and also about her career as a filmmaker in Italy, where female directors are few and far between. Why did you want to tell the story of Italo and this town? Italo is the beautiful true story of a stray dog that really lived in Scicli, Sicily. 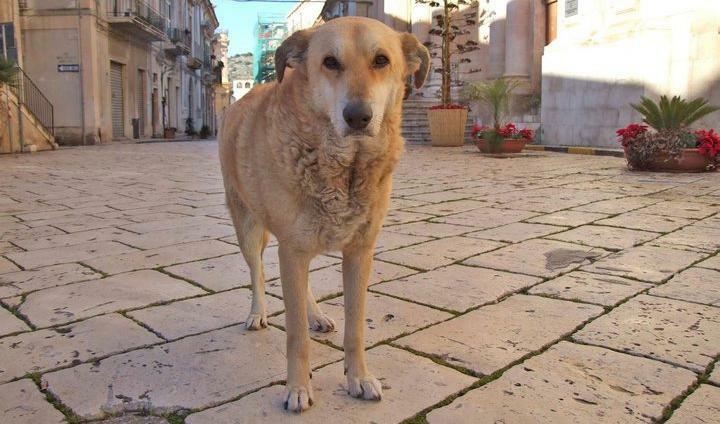 He made the headlines in 2009 because the mayor of the town launched an initiative to get rid of all strays in the city due to an attack on a child. The whole town came together and fought the initiative. So, Italo became a symbol of acceptance in the face of adversity. I just fell in love with Italo’s wonderful, collective story of love. Was your childhood dream to become a director? The first time I stepped into a movie theater, I was 12-years-old. I expected to see a larger television set. Instead, I found myself in front of a ritual. Everything was magical- the darkness, the silence of the room. Something happened between the screen and the audience. That day I decided that I wanted to have the power to communicate with the audience through that screen. So here we are, 23 years later. What are the challenges of being a female director in Italy? Recently, I read that only 4% of films are directed by women. I think it’s a great pity that the female sensibility and point-of-view is so little used. But I don’t really think in terms of showing women’s issues. I don’t’ think in terms of men or women. I just think in general terms of the stories that I want to tell. I choose to work with other filmmakers based on their work not their gender, and I have never felt discriminated against or privileged because I am a woman. Since you directed and edited Italo, how has your work as an editor helped you in the director’s chair and vice versa? Having the eye of an editor is truly a privilege on the set because you know right away if everything you need for a scene is right there in front of you. It helps to save resources when you’re working with a low budget. However, the editor is the one that usually frees the director’s obsessions and puts his or her mind to rest. The editor is the one with the clear mind cutting and sewing the pieces together with a renewed freedom. This is what I lacked having already directed the film. So, that’s the other side of the coin. Talk to me about your Sicilian pride.. do you want to tell more stories of Sicily? There are no words to express my pride in belonging to a land so rich in beauty and absorbing its ancient knowledge. I hope be able to adequately recount this. The story of Italo gave me the opportunity of documenting a true story of Sicily with my perceptions of some of its characters and traditions. I’m sure it will not be the only story of Sicily that I tell. What is your dream as a filmmaker? I want to move as many people as possible through my stories and really touch their hearts. I want to feel that we can always be a little bit better than we are today. Alessia Scorso's film is a treasure. Given the ongoing issue of abandoned animals still roaming the streets of Italy from North to South, Italo remains a very relevant and important film to see.